Are you looking to thank your clients for their business? build client loyalty? Do you own a wealth management firm and are you looking to build loyalty wit your clients? Find gifts that are more personable than a pen? We have put together a list of the top ideas about what to buy for client gifts. Our client appreciation gifts can be given for any client's birth year or anniversary year AND can personalized with your branded message. Order our client gifts in bulk, and we ship them directly to you We can drop ship your personalized gifts to your clients timed so they arrive on or before their special day! Choose a client gift from this page. Contact Us and tell us how quickly you need it and how many you need. We'll give you a price quote and arrange for shipping and payment. That's It! Do you have a special client birthday or client anniversary you would like to honor? 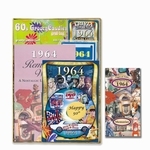 We can build a special time capsule that you can personalize for any year from 1942 to 1980. This year you were born book is a softcover book full of trivia, color ads, prices, and information about a certain year. Call for a volume discount. For any year from 1927-2001. Perfect as a birthday gift for clients. Contact Us for a price quote. Created for any birthday year. Has your client's name and birthdate, and YOUR COMPANY'S PERSONALIZED MESSAGE at the bottom! Unique gift! Contact Us for a price quote. Top Milestone Hits from 1938-1979. Your clients will dance around the room listening to the top 20 hits from the milestone year they were born. Contact Us for volume pricing. DVDs of events from 1929-1981. Makes the perfect company gift for your client. Contact Us for details. Picture frames for any year. Alderwood frames laser etched celebrating your client's birth year. Contact Us for a price quote. Takes a single day and tell you what happened throughout history on that one day with a timeline. Personalize It! Contact Us for a price quote. Funny birthday gift for your clients- trivia cards that you can also use to play card games with. Has Q & A about the year. For years 1943-1980. Contact Us for a price quote. For any year 1930-2001. Contact Us for a price quote. Gives the origin of your client's last name, family crest, motto. Comes framed. Contact Us for a price quote. We show the utmost professionalism when it comes to representing your wealth management firm via your client gifts. Talk to us about whether you'd like to personalize the gifts with your company name, or whether you are interested in having us drop ship the gifts directly to your clients for ease of use. We are flexible, and work with companies of all sizes. We pride ourselves on fast shipping. Orders that come in by 3 in the afternoon eastern time will ship out the same day, Monday through Friday. We can also stagger your clients birthday gift shipment dates- just give us a call if you have questions about this program works. You can expect all gift to cost between 4.95 and up to $100.00, depending on what you'd like to spend for your customer. Look to us to be the most helpful and affordable corporate gifts. To preserve client loyalty, BirthdayandAnniversaryGifts.com is here to help your company move forward in the process of finding and retaining your clients. Why not improve customer loyalty, by remembering your client's birthdays or acknowledging the year they were married? Just by giving them even a small gift, your company shows your client that it is a thoughtful organization, concerned with your customer's lives. Customer gifts can be small gifts, or can be personalized and more expensive gifts for your wealthiest clients. It doesn't mater which way you go- what matters is that it is a unique present. BirthdayandAnniversarygifts.com, we offer both. You can decide what is most appropriate for your customer or client, based on cost, your history with them, or whether you are reaching out as a reminder gift, or wanting to preserve client loyalty. A gift to a client if considered more special if you really know them, so it works best if you have an ongoing relationship and continual communication with them.l The gifting process dovetails nicely into your communication efforts. If you decide to personalize the gift to your client, your company's brand and message will stand out and stick in you client's minds permanently. On most of our gifts, you can add your own short message or greeting to either the product itself, or to the gold seal we attach to many iof the presents. Often with our bulk orders, we can personalize the client gift at no additional cost. It also does not slow down the shipment of your orders. Whether you choose our custom gift baskets with year-themed birthday gifts, or our music from any year, or our birth year books, we can work with you to ensure that our gifts go out the door quickly to your clients and arrive with your own company's branded message on it. we can often also add the client's name to the message if you prefer. Consider us for all your corporate gift needs. We really enjoy tailoring a solution that works for our customers, and we are very flexible. Remember that we can either send bulk shipments of products directly to you, or we can drop ship the gifts directly to your clients if you prefer. BirthdayandAnniversaryGifts.com is one of the industry leaders in the area of wholesale gift supplies. We offer all of our birth year gifts in bulk to to other gift shops, and offer good pricing for our wholesale gift customers. Feel free to email us or call us with any questions about wholesale pricing. We can ship orders directly to your gift shop the same day if the quantities are in stock.